Easily spotted by its bright orange door, you won't miss Petershams Millinery Supplies at The Artworks, Elephant & Castle's equivalent to Boxpark in Shoreditch. Founded by Californian Michelle Osborne, this is a place you'd come to get everything you could need to make a hat, fascinator or elaborate headband. Rolls of fabric line the walls, crowded with feathers, trims, bases, pins, combs, veiling and all kinds of decoration. There's also a box of vintage hats – for viewing purposes only – in case you're after a little inspiration. Petershams is Londons only dedicated millinery supplies shop. Stocking a wide range of hat bases, feathers and trims we supply budding milliners and the trade at our Deptford store. Interesting store. Great range of products. 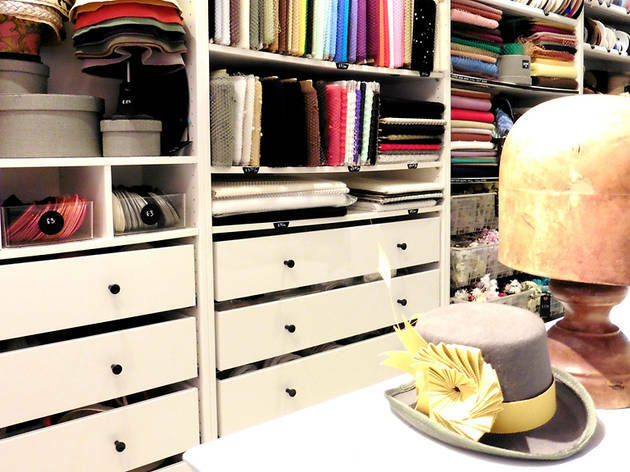 Wonderful Aladdin's Cave of hat-making supplies - well worth a visit! They've got it all--the usual as well as the rare--and the owner is a gem herself!! Has everything i need, and a cute dog to boot! 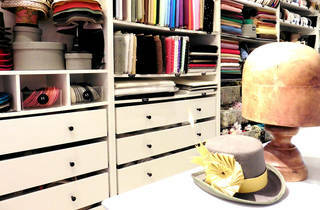 Great treasure trove to dive into for millinery supplies! Lovely bubbly, friendly helpful staff! I never leave empty handed! Beautiful shop set up, amazing and unique items and the loveliest and very knowleable shop owner! Great shopping experience! what a wonderful shop and a fun shop has all the supplies for making a hat for any occasion and very friendly staff very creative as well !! Love this shop! Beautifully layed out and so many amazing ideas for hats! Excellent merchandise, delightful shop and accessible location, service 1st class. I love Petersham's! Michelle, the owner, is simply amazing and will help even the novice with their hat making projects. A great shop with wonderful staff that had everything I needed and at a good price. A fantastic find for any lover of hats. Petershams has a huge array of millinery supplies on offer. The service provided by Michelle and staff is superb, friendly and brimming with knowledge of all things millinery. A true specialist shop. What a great place to find all your millienary needs! Staff are always helpful to give advice and in a friendly manner. Great little shop run by great people. Everything you need for making hats and other crafting endeavours. Hat making is no longer a dying art! Brimming with feathers, ribbons and materials it speaks of a bygone era and is a little treasure trove filled with sparkles! Definitely my happy place.